Have you ever doubted that a thoughtful group of committed citizens can change the fabric of their community? Doubt no more. Food Runners is the proof in the pudding. On Tuesday mornings mornings, when folks in need start lining up for a free hot lunch at Fraternite Notre Dame, the Food Runners truck is there with groceries piled high. When Alex at Taste Catering can't stand the thought of throwing away leftover food from an event, he calls Food Runners. 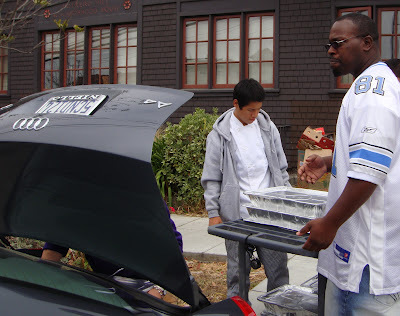 Weekly donations from Food Runners help programs like the Clara House, Bayview Hunter's Point Adult Day Health, North Beach Citizens, and Potrero Hill Neighborhood House, among others, stretch their dwindling budgets by freeing up funds which can be reallocated for other necessary services. At the close of Tuesday, Thursday and Saturday Ferry Plaza Farmers Markets, vendors can't wait to hand over their excess produce to Food Runners rather than compost it. Food Runners bolsters the greater community in so many ways besides the obvious service of helping feed the estimated 160,000 plus San Franciscans who go hungry on a daily basis. Food Runners provides an avenue for local businesses, small and large, like Trader Joe's, Da Bettina Catering, Leadbetter's, the White Swan Inn, Heroku and so many more, to help alleviate waste while keeping costs down at the same time. 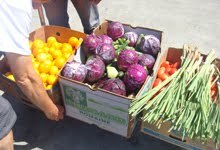 Food Runners keeps over two tons of edible food per week out of the trash at no cost to the donor. Another way in which Food Runners enriches the community is by offering citizens the opportunity to help their neighbors. Dr. Martin Luther King once said, "everyone can be great because anyone can serve." Food Runners volunteers live Dr. King's words every time they sally forth on a food run. If you have ever performed community service, you already know what Food Runners volunteers know which is, that community service is as important, if not more so, to the person who serves as it is to the recipient. In addition to plain old feeling good, volunteering can also be thought of in terms of monetary benefits to the community. Based on Volunteering in America's figure of volunteer time in California being worth $24.18 per hour, Food Runners clocks in at contributing over $3 million dollars to the city of San Francisco in calendar year 2012. Raindrops fall alone, but together they can cause a flood. Food Runners founder and Executive Director Mary Risley stated it best when she said, "I don't know how to help the world, but I know how to help my neighbor." Example is contagious. Is your kid's school having an auction this spring? Do you know where the excess food will go at the end of the event? Food Runners would love to pick up the leftovers and make sure they get delivered to an agency feeding those in need. Call 415-929-1866 to make arrangements. It only takes a moment.